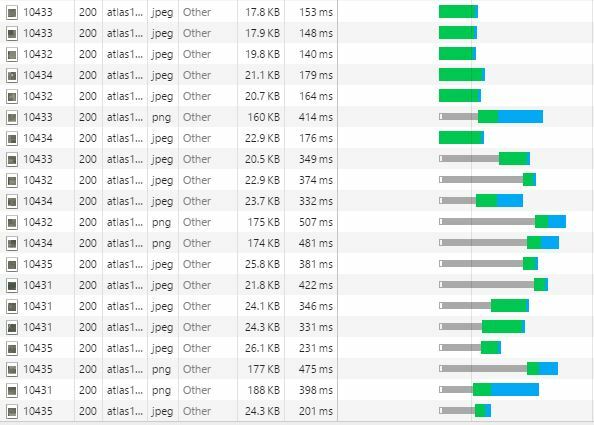 The performance of the GOHSEP 2010 downloader and web service has been improved significantly–10 times faster in some cases on the downloader page. The service was cached down to the 1:2,000-scale zoom level, and on the downloader page, the Leaflet map was modified to use the coordinate reference system of the data instead of projecting on the fly. This means, however, that the reference basemaps (MapQuest and OSM) included in other downloaders are not visible in the GOHSEP downloader because the map is in NAD83 UTM Zone 15, not the usual Web Mercator. The screenshot below shows some tiles downloaded when viewing the downloader.